Kayak Paddles for sale for touring and sea kayaking. Our most popular kayak paddle, great for recreational paddling and touring. Lightweight Glass shaft paddle perfect for recreational paddling and touring. The Tybee is a superb value paddle that offers excellent performance in a mid range touring paddle. Available with a fibreglass reinforced nylon blade as well as a super light carbon version. 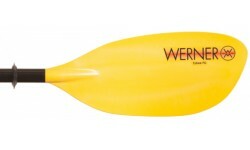 The Werner Shuna is a versatile, light weight & durable touring paddle that features werners 2 piece adjustable ferrule system. It is a high angled paddle with mid blades that offers excellent all round performance. The Corryvreckan is the largest of Werner’s high angle blades, designed for those who want maximum power from each stroke. Available in Glass or Carbon Blades with Werner’s 2 piece adjustable ferrule system. The Kalliste is the ultimate choice for low angle kayakers. Lightweight and versatile paddle. The mid size performance core blades fit a wide range of kayakers and are versatile to use during advanced manoeuvres or all around touring. The Ikelos is an aggressive High Angle design for experienced paddlers who want a durable, light weight paddle with both a powerful forward stroke and smooth linking strokes.